Going back to the good old days, the mindset was the more rooms the house had, the more attractive it was. But as time passes by, designers and homeowners start to embrace other designs that could fit more usable living space. The open plan layout trend then gained popularity. 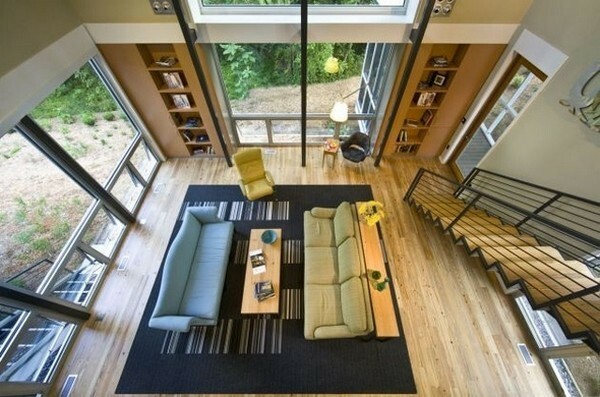 Open space layouts best illustrate the minimalist and sophisticated appeal of the contemporary design. They create a clear, spacious, and unconstrained area where natural light and air can easily reach every corner of the room. However, all great things have their own flaws. The biggest challenge in open floor plans is how you’ll be able to organize and define a space without the use of walls. Here are seven open space decorating tricks that will convince you that you don’t necessarily need walls in creating a room; only skill, creativity, and an eye for design. One of the simplest ways to define a particular area is through proper grouping. Place the furniture pieces oriented to each other in close proximity but reserve a generous amount of empty space as a part of the design scheme. The three factors to keep in mind are (1) the individual pieces of furniture, (2) the space around the pieces, and (3) space needed to access the grouping. Aside from arranging the decors based on their function and association with other pieces, it is always a good idea to combine solid and heavy pieces with light and airy ones and have a variety of shapes and sizes in your design to keep everything balanced. Break the monotony of an open layout through levels. Change in levels can designate specific zones in an open plan and can help emphasize the hierarchy of an area. For instance, a slightly elevated floor with a couple of stairs for the dining room and kitchen sets the area apart from the rest with an appealing transition. Aside from elevating spaces, the idea of a sunken room is also a must-try, especially in your living room. Rugs add a sense of sophistication and bold character to the interior. At the same time, they unite the pieces together and create an organized space without the help of walls. Area rugs should be large enough to fill an entire space. Another tip is to choose the rug shape that will go perfectly with the furniture it holds. Rectangular rugs are good but if you have circular furniture pieces, like a round dining table, go with the round ones. Color or material change in flooring leaves a visual cue of delineation in an open space. For example, you can instantly distinguish a kitchen from other areas of the open space dominated by warm wood by using dark tiles. Just make sure that the ceiling parallel to your floor as well as the placement of kitchen furniture are also in line with the transition. Aside from using floor elements to define spaces, the overhead elements also play a vital part in defining spaces. The beams and bulkheads don’t only add drama but also set the borders in an individual space. Dropped ceilings are smart additions you can invest in. Their presence on top of a particular room helps define the area in a subtle manner. Aside from the presence itself, these ceilings are ideal for providing space for stunning light fixtures like chandeliers, pendant lights, and recessed lights which also help distinguish a room. Apart from stimulating the mood, the smart choice, and usage of color help with the organization of a space. If you can’t commit to a huge structural change, try using paint to create an illusion. You may use color as a uniform backdrop to set the space apart from the area adjacent to it. You can also use distinct hues or pops of accent colors in the form of your furniture pieces and accessories like throw pillows, match rugs, and artworks. The uniform color scheme can create several rooms within a single large open space without the use of walls or dividers. One of the best ways to organize an open space is by using dividers which are not as obstructive as concrete walls. Modern dividers allow you to enjoy the best of both worlds for they define shared spaces without hindering the flow of light and air in the room. If you don’t want to create opaque obstacles, using glass partitions which come in full sizes and small sizes are recommended. But if you want to be more creative, lightweight dividers made from sustainable materials can be used to organize space. Using furniture as dividers are also ideal if you want to save square footage and minimize costs. Some of the recommended furniture for dividers are solid sofa table, smart shelving units, and sleek countertops. Carmina Natividad is an all-around artist and writer who loves collecting vintage items and decorating her space with an eclectic approach. She shares her deep interest in interior design by writing informative blogs for Fab Habitat Outdoor Rugs Online, a one-stop shop for stylish outdoor rugs and mats throughout Australia.